Forskolin 250mg is a weight loss supplement that claims to be the best around. It claims to have been showcased on the Dr. Oz show. Forskolin has been praised a “lightning in a bottle” and “flower to fight fat”. The main question that is raised is why the need for all the “star power” to promote this product? Is the confidence of the company so minute that they feel the need to have to bury this with all the promotional stuff? Can the product even stand on its own without all these star power campaigns? These types of claims can be potentially dangerous if Forskolin 250mg cannot live up to all the hype presented. The recommended dosage is to take one pill two twice daily. the preferred times are at breakfast and dinner. There are no listed side effects on the manufacturer’s website. There is the standard precautionary warning that states to consult a healthcare professional if you are under 18, pregnant, or breastfeeding. There is no price listed on the website. To get the price, you must click a buy now button to be taken to Amazon. Upon arriving at the Amazon website, you are presented with the currently out of stock wording. Because of this, there is no way to ascertain the price or when it will become available for purchase again as no information is available on either site. This bodes ill for a weight loss supplement that cannot be available for purchase by a consumer. There is no guarantee listed on the manufacturer’s website. Amazon, however, has a wonderful return policy. One just simply needs to login to their account to initiate their return. Living Fully Herbed Forskolin has no price listed on website nor price or availability due to product being out of stock. There is very little information on their website. It seems that the site is more geared to promoting a sales tactic by reiterating the product was showcased on Dr. Oz Show. The sales tactic is more geared to selling than informing the consumer. The lack of information is very troubling. The availability of the product in stock on Amazon and no other sites from which to purchase leads to some serious questioning. 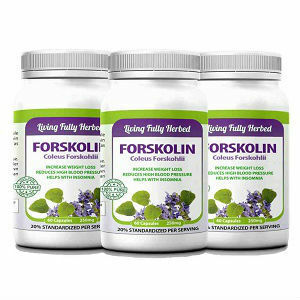 Danny Wild	reviewed Forskolin Living Fully Herbed	on December 18th	 and gave it a rating of 2.5.